A Raytheon Sentinel of the RAF showing its radar pod. A surveillance aircraft is an aircraft used for surveillance—collecting information over time. They are operated by military forces and other government agencies in roles such as intelligence gathering, battlefield surveillance, airspace surveillance, observation (e.g. artillery spotting), border patrol and fishery protection. This article concentrates on aircraft used in those roles, rather than for traffic monitoring, law enforcement and similar activities. Surveillance aircraft usually carry no armament, or only limited defensive armament. A surveillance aircraft does not necessarily require high-performance capability or stealth characteristics. It may be a modified civilian aircraft. Surveillance aircraft have also included moored balloons (e.g. TARS) and Unmanned aerial vehicles (UAVs). The Global Hawk family's US DoD designation - RQ-4 - may belie the Block 40's true calling. "R" is the Pentagon's designator for reconnaissance, .... But the true calling ... is surveillance, not reconnaissance. … Reconnaissance missions are typically more oriented for long-term intelligence-gathering purposes. The surveillance mission is much more integral to the kill chain, with more tactically oriented operations servicing the short-term decision-making process. In order to be surveillance, it is critical for the collection system, the target, and the decision maker to be in contact with each other in such a way that the actions of the enemy are relayed in real-time to those who can make decisions to counter the enemy actions. The terms “surveillance” and “reconnaissance” have sometimes been used interchangeably, but, in the military context, a distinction can be drawn between surveillance, which monitors a changing situation in real time, and reconnaissance, which captures a static picture for analysis. Surveillance is sometimes grouped with Intelligence, Target acquisition and Reconnaissance under the title ISTAR. Observation was the term used for surveillance when the main sensor was the human eye. 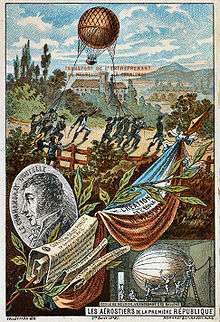 The first surveillance balloon, "l'Entreprenant", 1794. Illustration from the late 19th Century. In 1794, during the Battle of Fleurus, the French Aerostatic Corps balloon L'Entreprenant remained afloat for nine hours. French officers used the balloon to observe the movements of the Austrian Army, dropping notes to the ground for collection by the French Army, and also signalled messages using semaphore. One of the first aircraft used for surveillance was the Rumpler Taube during World War I, when aviators like Fred Zinn evolved entirely new methods of reconnaissance and photography. The translucent wings of the plane made it very difficult for ground based observers to detect a Taube at an altitude above 400 m. The French also called this plane "the Invisible Aircraft", and it is sometimes also referred to as the "world's very first stealth plane". German Taube aircraft were able to detect the advancing Russian army during the Battle of Tannenberg (1914). During World War II, light aircraft such as the Auster were used as air observation posts. Officers from the British Royal Artillery were trained as pilots to fly AOP aircraft for artillery spotting. The air observation role was generally taken over by light observation helicopters, such as the Hughes OH-6 Cayuse, from the mid-1960s. Pre war, the British identified a need for an aircraft that could follow and observe the enemy fleet at a distance. To this end the slow-flying Airspeed Fleet Shadower and General Aircraft Fleet Shadower designs were built and flown in 1940 but they were made obsolete by the introduction of airborne radar. 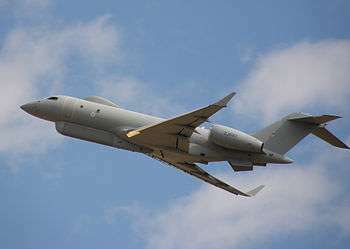 Maritime patrol aircraft are typically large, slow machines capable of flying continuously for many hours, with a wide range of sensors. Such aircraft include the Hawker-Siddeley Nimrod, the Breguet Atlantique, the Tupolev Tu-95, the Lockheed P-2 Neptune and the Lockheed P-3 Orion/CP-140 Aurora. Predator UAVs have been used by the U.S. for border patrol. Unmanned surveillance UAVs include both airships—such as Sky Sentinel and HiSentinel 80— and airplanes. Most air forces around the world lack dedicated surveillance planes. Several countries adapt aircraft for electronic intelligence (ELINT) gathering. The Beech RC-12 Super King Air and Boeing RC-135 Rivet Joint are examples of this activity. ↑ "LA Now – Southern California, December 7, 2009,". Latimesblogs.latimes.com. December 7, 2009. Retrieved May 20, 2010. ↑ Govers, Francis X., III (2013-06-11). "Nevada company launches silent Sky Sentinel UAV airship". gizmag.com. Retrieved 2014-08-16. ↑ Perry, William D. (Fall–Winter 2010). "Sentinel in the Sky" (PDF). Technology Today. Retrieved 2014-08-16. U.S. Centennial of Flight Commission: "Military Use of Balloons During the Napoleonic Era". Accessed April 1, 2007.